I love finding new uses for some of my favourite ingredients and chickpeas were a great canvas this time for this Chickpea Salad Sandwich. 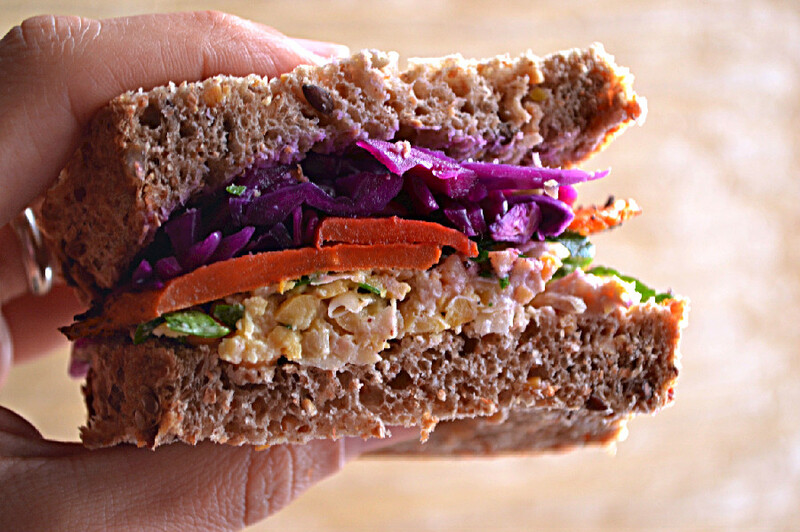 I know what you’re thinking and no this wasn’t created to be a knock off of a chicken or egg salad sandwich, but rather a healthful nutrient rich plant based sandwich filling that just so happens to recall the latter two. 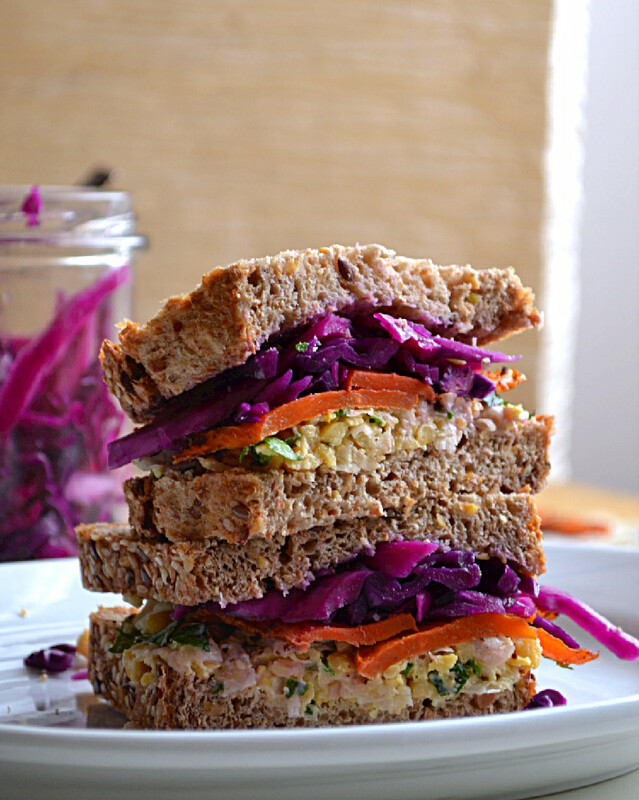 Chickpeas are mashed with a fork, mixed with lemon juice, tahini, sea salt, fresh ground pepper, fresh parsley and fresh mint and sandwiched between two slices of multigrain sourdough bread with sumac roasted carrots and quick pickled cabbage. You could just as easily put it all on a bed of mixed greens for a breadless option if that’s your preference, or roll it into a wrap. Either way it makes a great lunch at home or on the go. Chickpeas are the plant based eaters best friend. They’re an excellent source of protein, fiber, folate, iron and many other vitamins and minerals. The insoluble fiber found in chickpeas makes them great for digest tract support. They’re also an excellent source of antioxidants, helping the body fight free radicals and are incredibly satiating, satisfying our appetite for hours. Chickpeas are versatile and can be used in many preparations from the ever popular hummus bi tahini and falafel, to soups and stews and can also be roasted to make a crunchy snack or salad topping in place of croutons. 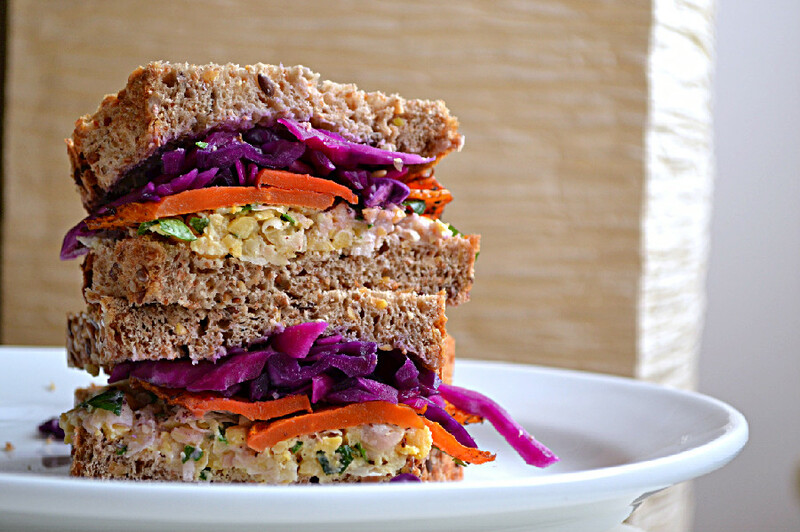 Chickpeas are mashed and mixed with lemon juice, tahini, sea salt, fresh ground pepper, fresh parsley and fresh mint and sandwiched between two slices of multigrain sourdough bread with sumac roasted carrots and quick pickled cabbage. Mash chickpeas with the back of a fork until they are all coarsely crushed. You don’t want them pureed, but you want them crushed enough to clump together. Add in all other ingredients and mix to combine. Adjust seasoning to taste. Preheat oven to 180 C and line a baking sheet with parchment papter. Toss carrots with remaining ingredients and bake on center rack for about 15 minutes. Toss together all ingredients until the cabbage begins to release liquid. Store in the refrigerator in an airtight container or jar until ready to use.